The tall, straight trees that dot the landscape of German towns and cities speak volumes of their undying enthusiasm for all things neat, clean and minimal. 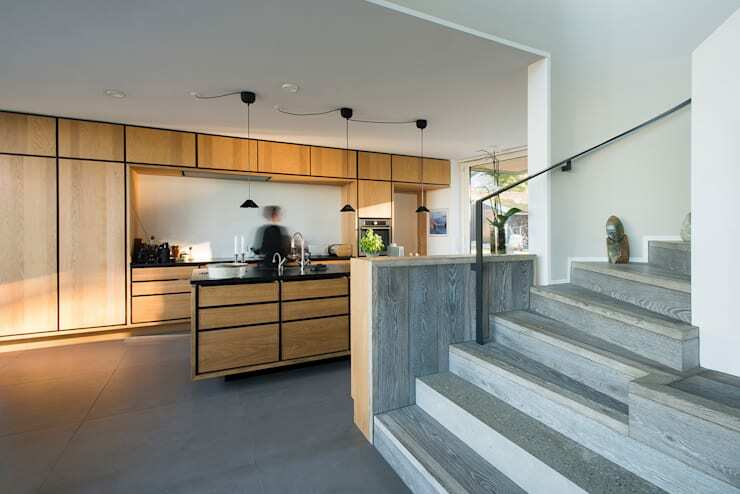 The no fuss approach of the Germans comes through in this home – a study in fusion where the love for straight lines comes together with touches of luxury. The predominantly white villa exudes a charm that makes one fall in love with the modern school of design. Solid wood and stone are combined with glass to give a neat look like none other. 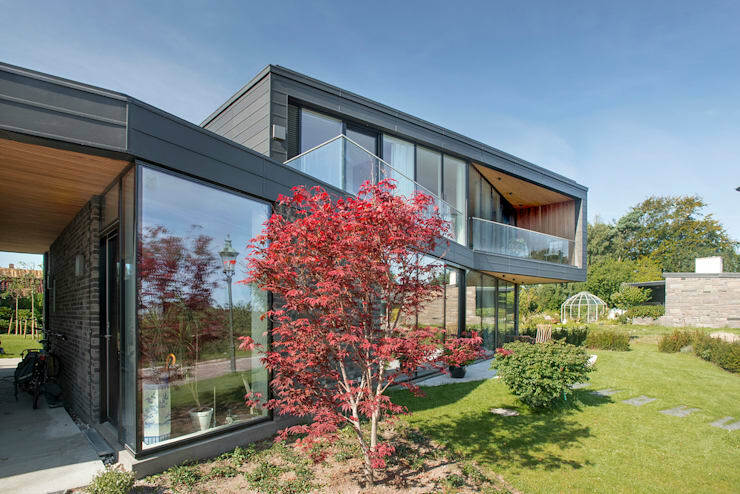 Villa U is a German home designed and built by C FMoller Architects in Aarhus, Germany. The fun is in the straight lines. The typical Germanic façade of the villa is made up of geometric structures. While not as flamboyant as its Dutch neighbour, it still relies on a subtle play of style where the floors are piled on to each other in opposing alignment, for minimalist elegance. 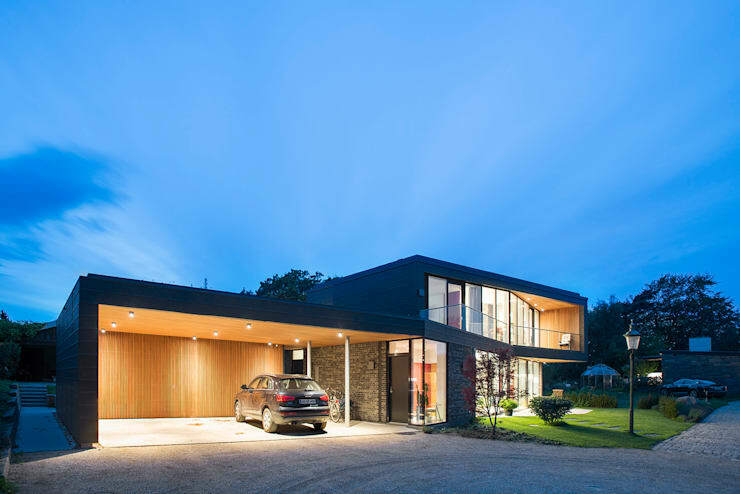 Devoid of the usual slanting roof, this home brings in straight terraces and rooftops. Recessed lighting makes for a soft glow in the porch as well. The far end of the roof’s top corner suddenly juts out into the horizon, giving the villa a playful appeal. The wooden panels caress the space formed by this sudden spear. Glass panels in proud wooden frames hold the structure in row upon row of sleek transparency while soft recessed lighting holds the look aloft in an elegant glow. The back yard is a lush untouched expanse of green with a simple stone path leading up to the picnic furniture casually laid out on a concrete patch. The kitchen oozes style with running oak cabinets that conceal all the crockery and appliances. The icing on the cake is the nook created for the stove and range – a neat space that has a bank of drawers underneath. The island houses the sink and is replete with dark wood highlights that outline all the cabinetry in the kitchen. Overhead industrial style lamps complete the chic factor here! Warm yourself next to the uber stylish fireplace, done up entirely with black, slate coloured and grey metro tiles. The randomly patterned tiles offer a break from the stark whiteness of the entire villa. It also greets you as soon as you enter the home. 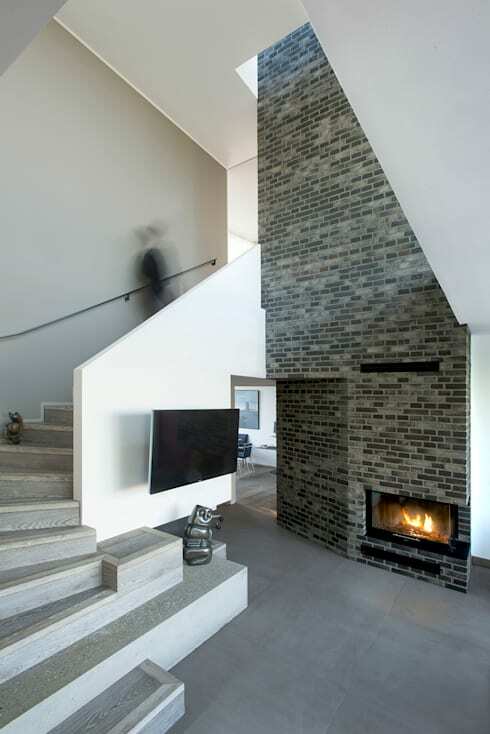 The fireplace sits right next to the stairs and gives the high ceiling a focal point by jutting right into it. The sliced off edge gives it a chic look and carries on the running geometric theme of the home. 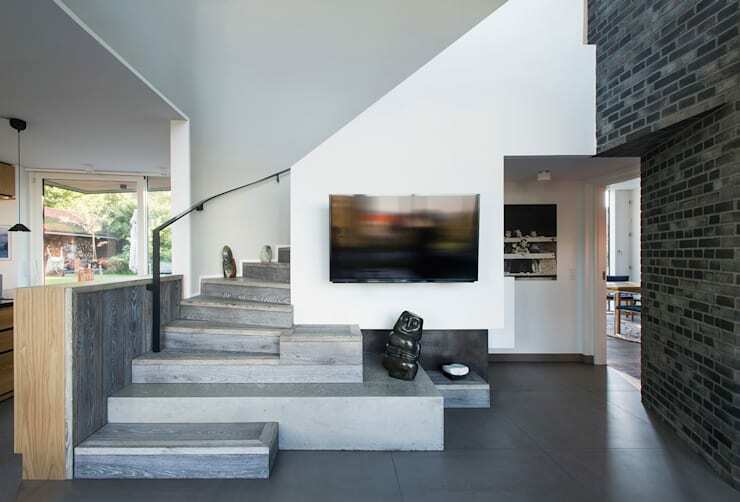 The TV is secured to the wall that clads the partly glass staircase. The slightly spiral staircase lets one of its stairs jut out slightly so that it becomes a low table of sorts for the ultra modern sculpture and other curios to rest on. Sitting on the stairs and enjoying the fireplace and the TV seem to be an ideal, fuss-free option for evenings spent in this home. That, or just a good book and a few cushions to sit on the stairs, propped up against the solid wooden divider that sets the kitchen and dining area to a side. Long walks around the property can tempt visitors easily from the very first glance at the home. The stone pathways and unhindered expanse of green manicured goodness for a lawn leave the senses rejuvenated. Colourful foliage dots the grounds and adds pops of colour to the brick walls and glass façade. This home exudes a minimalist charm that makes it comfortable and stylish at the same time. The white walls, the brick detailing and clear panels of glass come together for a look that speaks of good design. 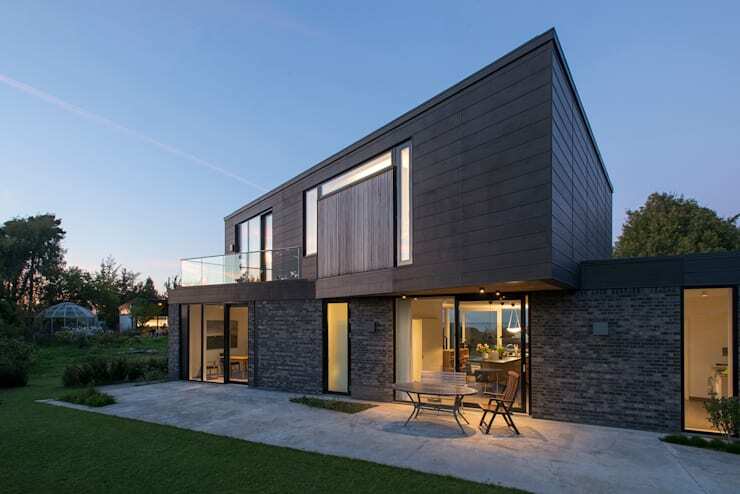 In conclusion, the geometric shaped home is a complete winner in the style department!